You might not be aware, but on top of everything else she’s in charge of, Mandy pretty much writes the newsletter every week. Over the years, we have edited enough of each others’ writing to know the idiosyncrasies of each others’ writing styles pretty well. Mandy tends to be a very direct writer. She found “The Elements of Style” by Strunk and White quite early, and I think it really spoke to her. It has certainly served her well. She is a clear and lighthearted communicator. She wouldn’t, for example, ever use the word ‘idiosyncrasies’ in a newsletter. I, on the other hand, am afflicted with a curse of overly verbose diction. I love grammar and language and how trixy they can be. Doubtless, Mandy will wake up tomorrow and cringe when she reads this. Alas, she is asleep, and this small token of appreciation and thanks we send to our dear customers, this celebration of our season and the produce it procures, is up to me. Grab your thesaurus, dear reader, it may be a bumpy ride. It’s the peak of the season! Or close to it. This is the time of year we all think about when we’re struggling through a fourth cold snap, mid-February. It’s nice to stop and really appreciate it. I had the very great pleasure of hanging 300 row feet of garlic in our drying shed late last week. The smell of heat and garlic and soil all wrapped up together with jute twine and hung from the drying racks is simply magical. 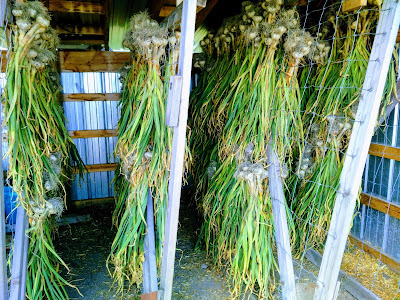 I don’t always love some of our repetitive tasks, but I could hang garlic all day, every day. We have amazing weather coming – highs in the mid-80s and sunny as far as the 10-day forecast can see. Every time you turn around something in the gardens has grown bigger. But already we are starting to seed our fall plantings, and our prop-house is filling with the last things of the year. We think of our season as a 100 day sprint between last frost and first frost. We are right about at the midpoint of that window just now. 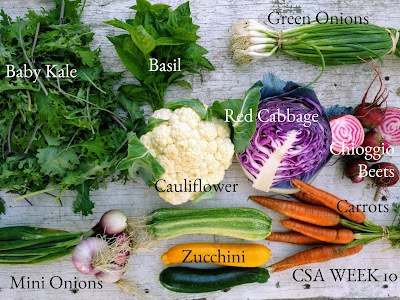 In short, the time to take advantage of fresh veggies is now. We love seeing all of you in the various different places you can do just that. We’d love to continue last week’s great success direct ordering by email for pick up with your share. 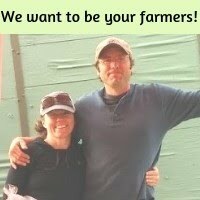 Our farm-stand on Thursdays from 5-6pm has become a smashing success as well, and has the added benefit of bringing in some friends and neighbors. And it’s always nice to chat with those we see at the market on Saturday. We love how many of you see the CSA share as a mere starting point for your much larger weekly veggie plans. The basil is begging to be made into pesto. Pesto recipes are pretty simple, just zap up some basil in a food processor or blender with a dose of extra-virgin olive oil, add some salt, a few of those scapes if you still have them, regular garlic (is coming!) if those left your crisper weeks ago, add some Parmesan if you’ve got it, and there you have it. Traditionally, pine nuts are a part of pesto recipes. We find that to be just a bit too expensive. We substitute toasted walnuts or sunflower seeds. Pistachios or almonds or roasted pumpkin seeds work too. You just need something nutty and roasty to pair with the sharp basil and garlic flavors. Don’t skip the toasting part – it brings out that nutty flavor. You won’t regret using the whole bundle for pesto. My favorite way to eat pesto is on pizza, but it’s fantastic on just about anything savory and light. Grilled chicken and pesto?! Yum.